"Our club is the biggest in the north-east, should be one of the biggest in the country and the Premier League is therefore the only place it belongs. However, due to our other TV and film commitments, now isn't the right time for us to get involved. We owe that to all the other fans for whom, like us, SAFC is such an integral part of their histories and future. "Whether it is Mr (Ellis) Short who remains in control or new owners who come in, we will always support the lads and offer any assistance, at any level, in helping to re-establish this great club at the level it deserves to be." 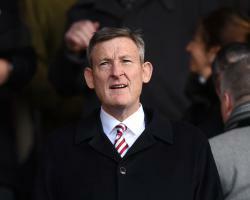 They and a German group are understood to have held talks with current owner Ellis Short as he attempts to offload the club, who were relegated from the Premier League at the end of last season. The German consortium is understood to have reached a more advanced stage in negotiations. Sunderland are currently without a manager following David Moyes' departure last month, with the search for a replacement having been slowed by the uncertainty surrounding the ownership.